Users can create an enterprise architecture diagram with this recommended enterprise architecture diagram software. Feel free to check details below to start your work right away. Wanna do your business projects effectively in both short-term and long-term? Would you prefer an even advanced application of your business strategies for daily operations and technological improvements? Then simply look at this professional and handy enterprise architecture diagram software to improve your decision-making process and optimize your organizational resources. The software offers you with rich fully editable architecture symbols, templates, and the easy drag-and-drop user interface. Administrators and professionals can quickly create good-looking enterprise architecture framework in a few minutes. 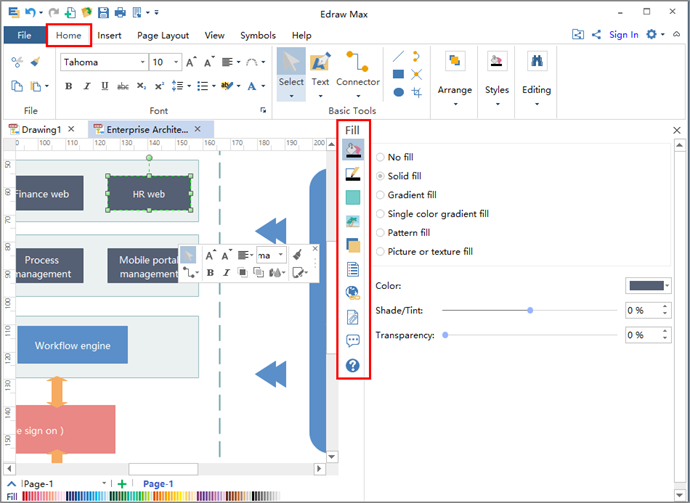 You can also freely change task background, make new or remove existing connectors between elements in your diagram. Once done you can review your project in full screen, or export to different formats including PDF, Html, PPT, SVG and Word. 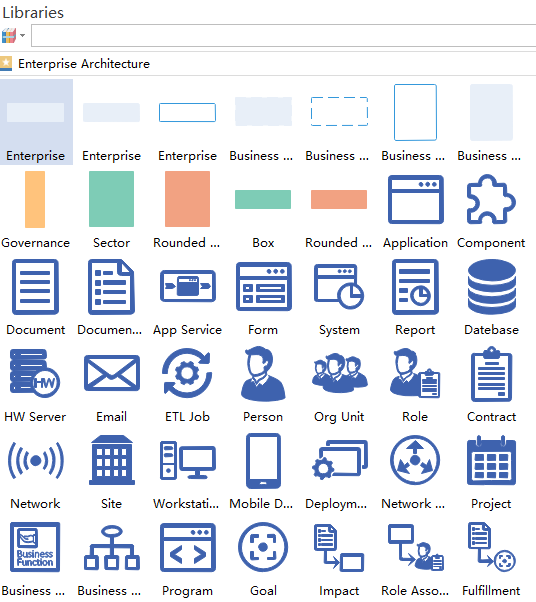 In the software, you can find a collection of commonly used symbols for building the enterprise architecture framework. Simply refer to the Libraries of the Enterprise Architecture Business Diagram section to use them for many different sub-categories like basic structures, servers, databases, programs, etc. Feel free to customize the sizes or colors of these editable symbols based on your needs. When you go to the Home section, you can select from a wide range of functions like text tool, font customization, shape alignment and spacing, connectors, quick styles, etc. 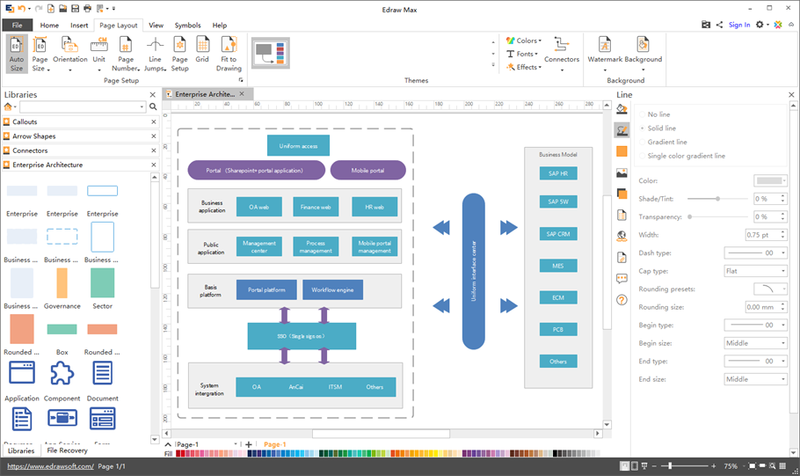 Furthermore, from the Insert menu of the enterprise architecture diagram software, you can add images, tables, external links, attachments, and notes to your enterprise architecture design. Frequently used tools can also be accessed at the right sidebar. You can set up different page sizes or insert page numbers for multiple tasks purposes, or for complex projects with lots of pages. If you do not like the existing theme style, you can switch via the Themes section. 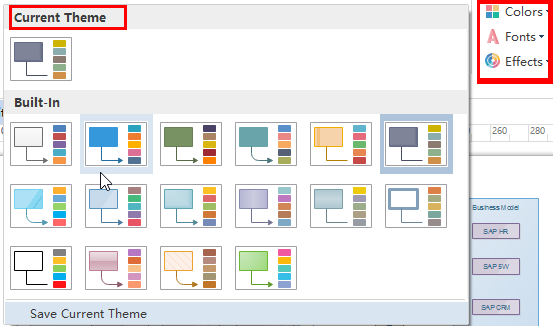 Furthermore, you can set various theme colors, content fonts, and connector styles for your work. One more cool thing about the enterprise architecture diagram software is that you can edit your own symbols by using the preset drawing tools in the Symbol tab. You can directly insert the existing shapes or lines, or go to the geometry operation function to combine items quickly. You can share your final enterprise architecture diagram in the built-in personal or team cloud account. 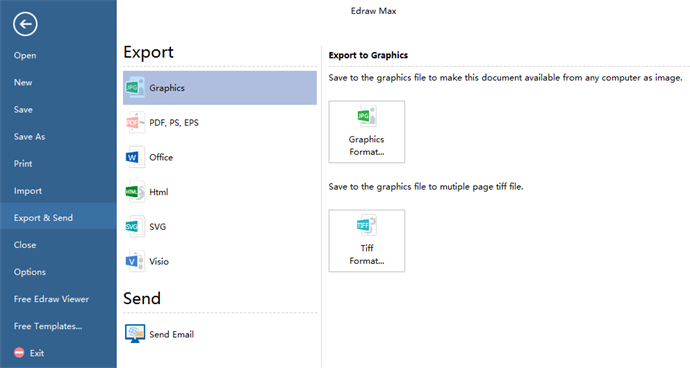 Furthermore, you can export documents to different formats covering PDF, SVG, HTML or Microsoft Word.